A new credit card scam could cost you hundreds of dollars, and your bank’s fraud department may never notice the suspicious charges — without your help. An Ohio woman recently became a victim of this scam. Her husband, identified only as D.H. from Pepper Pike, Ohio, shared their story with Cleveland.com. It’s an example of the length scammers are willing to go to steal your money and, in the process, make it tougher for you to get your cash back. The scammer stole her credit card information and used it to buy a Lenovo Ideapad from Best Buy for $572.39. Thankfully, the victim and her husband signed up for email alerts with their bank and immediately saw the charge, even though it didn’t set off any fraud alerts. The victims called PNC Bank, reversed the charge and canceled the card right away. But a few days later, UPS brought the Ideapad to their doorstep. According to Cleveland.com, that’s a part of the scam too. The scammers send the pricy product to your home to avoid scrutiny. If fact, shipping the laptop to the victim’s home is likely what made PNC and Best Buy look the other way. The scammer’s plan is that the victims don’t notice the charges until the laptop arrives. Then the scammer hopes the victims become so preoccupied with getting the charge off of their credit card and the laptop back to the store that they don’t notice what happens next. The day after the Ideapad arrived, the scammer presumably processed a return through FedEx. The only problem was the address on the FedEx return label was not to a Best Buy location. It was to a house in Philadelphia. According to Cleveland.com, the scammer anticipates that the preoccupied victim will not notice the address and will instead send the ill-gotten laptop right to them. In a convoluted plot already full of twists and turns, there’s a reason why the scammers aren’t afraid to put their addresses on the return labels — the scammers aren’t shipping the electronics directly to themselves. Instead, the scammers find people to serve as middlemen to intercept the products, then ship them to the actual scammer. They find these middlemen by posting what seem like legitimate work-from-home gigs online and recruiting innocent people to send the stolen goods their way. The Ohio couple, clearly the luckiest people ever, didn’t fall for that part of the scheme either. Instead, they had already returned the laptop to a Best Buy near their home by the time the FedEx employee showed up at their door. Although the scammers didn’t get their hands on this laptop, they didn’t lose anything because they used their victim’s money. This Ohio couple did everything right and still had a tough time explaining this scam to skeptical Best Buy employees. To protect yourself, be sure to sign up for free alerts from your bank or credit card company so you know early when someone makes a large purchase. 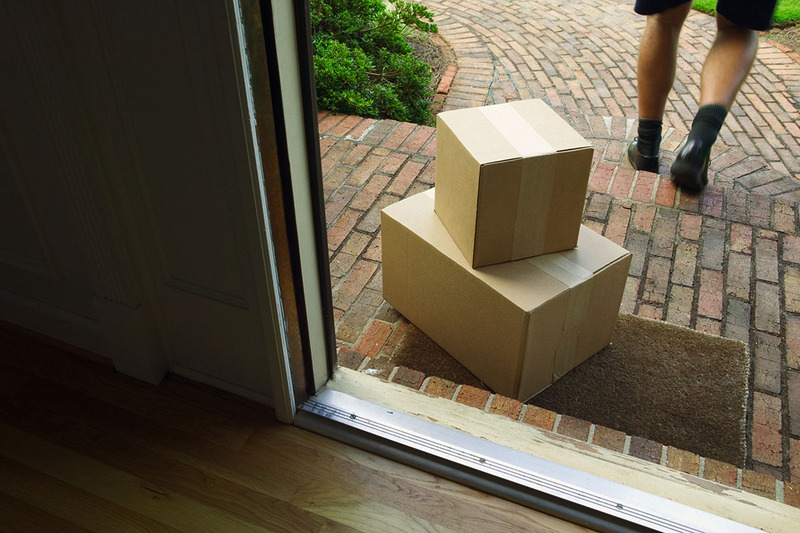 If something you didn’t buy ends up on your doorstep, don’t return it through any shipping service. Instead, go to the nearest store and return it in person and explain what’s going on. If that’s impossible, call the store’s customer service line to report what happened. Be sure to insist on getting a case number to document the incident and double-check the address on any return label you receive before shipping anything off. If you accidently return the item to the scammer instead of the store, you could be on the hook to pay for the product, even if your bank initially refunds your money. Of course, those who get their credit cards stolen aren’t the only victims here: the work-from-home middlemen also get the short end. If you want to work from home without ending up in the middle of a criminal mastermind’s schemes, read up on how to find legitimate work-from-home jobs with companies you can trust. Your Turn: Seriously, have you ever heard of a scam with more steps than this one? Tell us about it. Desiree Stennett (@desi_stennett) is a staff writer at The Penny Hoarder. She thinks if these scammers are willing to work THIS hard, they should just get normal jobs.